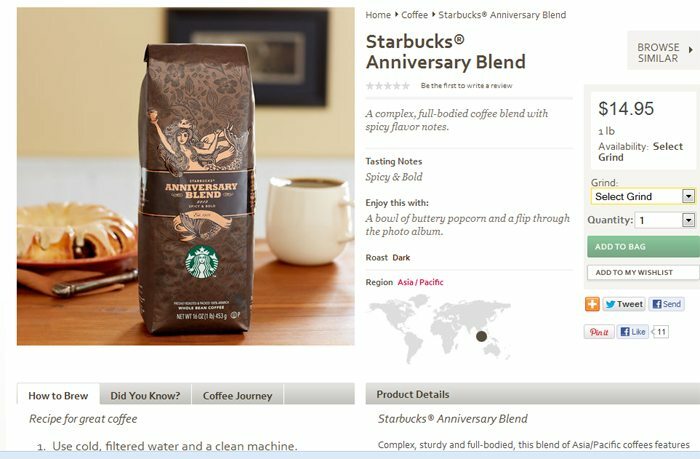 Starbucks launched Anniversary Blend on September 5th this year! This coffee has returned every single year since 1996, which was the year Starbucks introduced it as tribute to their 25th Anniversary. It is a favorite coffee of many, known for its spicy, bold flavor notes which come from the Aged Sumatra component of this blend. It’s always a dark roast. First thing we did, as with every coffee tasting, is smell the coffee. This year’s blend is quite herbal both in smell and flavor. One customer thought that coffee smelled like “cedar” wood! The second step is to “locate” where the flavors connect in the mouth. For me, I noticed this all across the front half of my mouth. The flavor has a big punch this year, and lingers a bit too. It’s a big coffee! True bold coffee fans will love it. One interesting this is that this coffee has such a complex flavor that it is true that many different things might pair very well with it. There was a barista in attendance (from a different store) who commented that she thought that the cinnamon chip scone was a great pairing with this coffee. 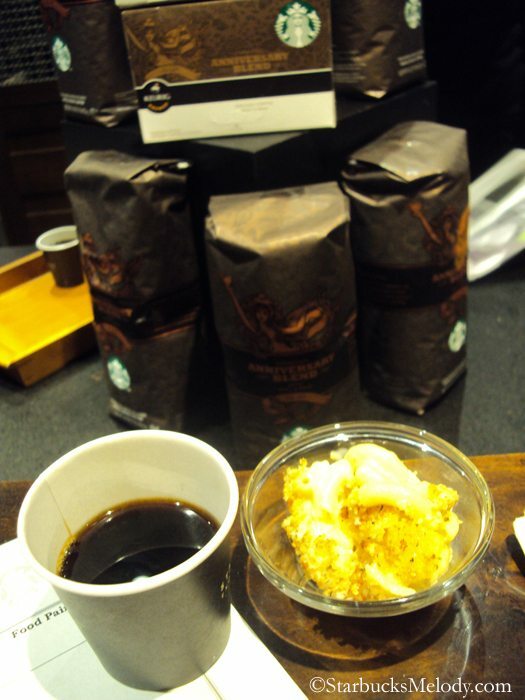 Another interesting thing about this coffee tasting is that we tried it as a drip-brewed (Bunn brewed) coffee. Should you try this coffee? Definitely yes, if you like bolder blends. For the first time ever, it is also available in the K-Cup format. 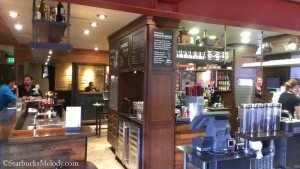 It really has been a long time since I had an “open thread” so feel free to talk about anything Starbucks-related in this thread. As always, I love reading your comments. By the way, just because I don’t reply to every comment, doesn’t mean I don’t love the comments. I do love your comments! Starbucks Brezza Coffee Blend: cold brewed iced coffee sangria recipe. 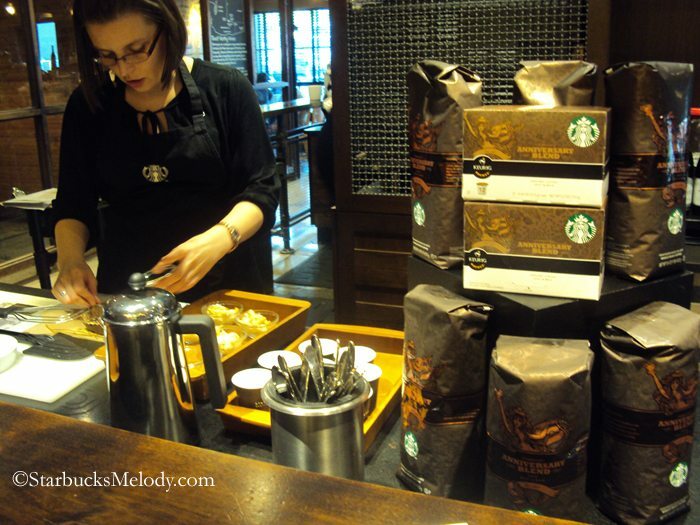 Dana’s Bucket list… Go to coffee tasting! Sounds fab Mel! Thanks for the info. Anyway, I absolutely LOVE Anniversary this year! It’s awesome with my bacon breakfast sandwiches in the mornings, or even my cinnamon oatmeal. I’ve surprised myself by how much I’m really starting to enjoy bolder coffees. I miss Olive Way. It’d be so much fun to attend all the seminars they host there. What a fun, fun store. This review couldn’t come at a better time, we just ran out of beans this morning and I happen to be going to Starbucks tomorrow morning. Of course, I will be getting my usual mocha and Reduced Fat Turkey Bacon but I will surely check to see if my local SB has the anniversary blend. Does it come in decaf too? For a coffee that has “… such a complex flavor” does making it available as a K-Cup do justice to the flavor? Anniversary Blend was such a great complex coffee. I used to stockpile my partner markouts of ANV. Loved that coffee. I had it today. All right. Bold? Yes. Interesting? Not so much. Complex? Kinda. Which brings me back to my first point … does a truly complex coffee reveal its flavors in a K-Cup? When I visit my father in Dallas, I use his K-Cup brewer with SBUX K-Cups. House Blend shows well on a K-Cup but it’s “light and lively” which means it ain’t complex beyond its nuttiness and brightness. Too much is compromised for convenience when brewing a K-Cup. ANV, nor XMA, shouldn’t be sold in K-Cup form and certainly not in Via form. Just the opinion of a “middle school” SBUX guy. Truffle mac and cheese…are you serious?!?! OMG I bet that’s good! 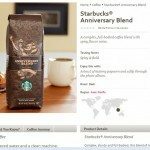 I am excited for the Anniversary Blend…and I’ll probably end up getting the k-cups too to compare. But I’m sure the WB will be better, it always is! Why haven’t you taken me to a tasting and evening menu dinner yet?! Well, I am one BOLD coffee lover and I have never liked this coffee and I remember well the yr it came out…….did not like it back then and have never liked it since. too spicey, altho didn’t taste so much of that this yr….maybe even last yr? Last yr or yr before I could taste a maple flavor. I agree that it “lingers” and I don’t care for that so much. I’d rather feel a crispness, smoothe and BOLD. Anniversary also makes a great cold brewed iced coffee! @Kurt – I wouldn’t have thought that Anniversary Blend would make a great cold brewed coffee! Interesting. Thank you for the tip!